In a down economy, and we all know this is a down economy, discount retailers perform better than those catering to the middle or upper middle class. So when dollar stores and deep discounters are reporting strong sales, everyone else starts looking at the reasons why and the answer may surprise: Food stamps. Stores, like Family Dollar, that accept Electronic Benefit Transfers are prospering simply by accepting the cards. There's a list of products that qualify -- food items and necessities -- and those that don't like alcohol, pet food and cigarettes. But not all retailers were set up to process these payments, although that's starting to change. 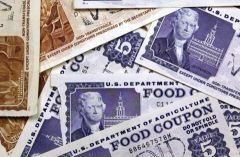 Convenience stores like 7-Eleven, CVS, Target and even wholesale clubs like BJs and Costco are starting to accept EBT payments. What's stunning is that according to USA Today, Costco's move stems from customer requests. Yes, the very folks that pay a membership fee to shop there and rave about the quality of Costco's cashmere sweaters and fresh salmon. Both Costco and Target cater to slightly more upscale consumers than direct competitors Sam's Club and Wal-Mart.These customers have gone from scaling back spending on extraneous items, to making more price based decisions on necessities and now, are using government assistance. Just another sign of the times.